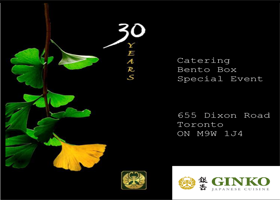 When I walked into Koyoi, a Japanese restaurant near Bloor and Wellesley in Toronto, it felt like being back in Japan. Even though there are many restaurants in the area, Koyoi is always crowded right after it opens at 5 p.m.
It’s different from an Izakaya, which is a Japanese-style bar like Guu or Dondon Izakaya. Koyoi has a variety of Japanese food from appetizers to desserts, and it comes closer to the real Japanese taste than other restaurants. In addition, Koyoi’s food is not oily, so everyone can eat there and feel healthy. 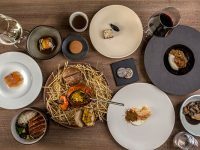 During this review, I sampled a number of dishes at the restaurant and here are some of my thoughts. Beef Tataki, seared, with ponzu $5.99: This fillet of beef is charred just on the outside and is left almost raw, but it is served chilled. The beef must be wrapped around the daikon and green onion that comes along with the dish. The ponzu is flavorful and little bit sour, but has a sweet taste though not like a dessert. The sauce has a vinergary taste and when mixed with the taste of the beef it is the perfect combination. Tataki is very popular in Japan and it has a really good taste. You should eat it as a prelude to deep-tasting food. 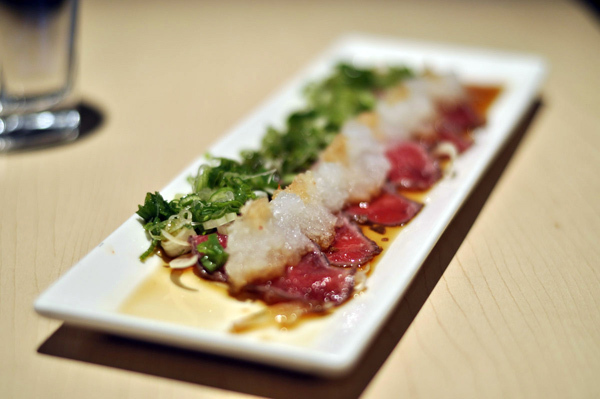 The almost raw beef, a daikon, green onion and ponzu are perfect combination. Grilled Beef Tongue, on hot plate, $7.99: Tongue has a specific taste and its texture is tougher than normal meat. Though you might think it has a strange texture, in Japanese we call its texture “Korikori”. This word is hard to describe in English, but it describes the feeling of eating a piece of meat. For instance, beef intestine or tripe is a common ingredient found in Korean, Chinese and Japanese hotpots and barbecue. It is a perfect example of “Korikori”. 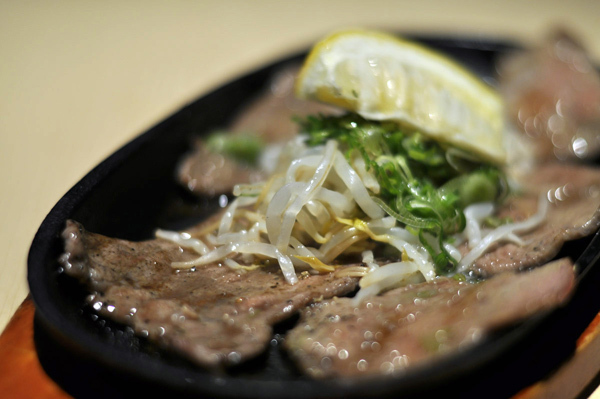 Koyoi’s beef tongue has a soft “Korikori”, and its sauce is a tasty combination of oil and lemon. 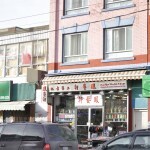 In addition, green onion makes for a good accent in look and taste, as it is sweet and spicy. I recommend this dish strongly to you, and it is a great prelude to Okonomiyaki. Beef tongue is common piece of meat for Japanese barbecue. Lemon is great fit with tongue, makes very good taste. Okonomiyaki, egg, cabbage, pork, katsuobushi, and aonori, $7.99: When I was 19-years-old, I worked at an Okonomiyaki restaurant in Japan, so I know how to make the dish. There are many kinds of Okonomiyaki in Japan, but the restaurant I worked in used a lot of cabbage. In my opinion, Koyoi’s is better than my restaurant’s as it uses less cabbage and more batter, but this is just my preference. Okonomiyaki is salty and has a similar taste to yakisoda and takoyaki. Katsuibushi (bonito flakes) are placed on top and give the dish an umami taste. Though it seems like an unhealthy food, there are many kinds of ingredients like cabbage, seasfood, egg, and other vegetables that are good nutrition. However, it’s not something you eat everyday or you’ll get a big stomach. Okonomiyaki is a common Japanese food, and is popular in mostly Kansai region as Osaka, Kyoto and more. It has a great and deep taste. 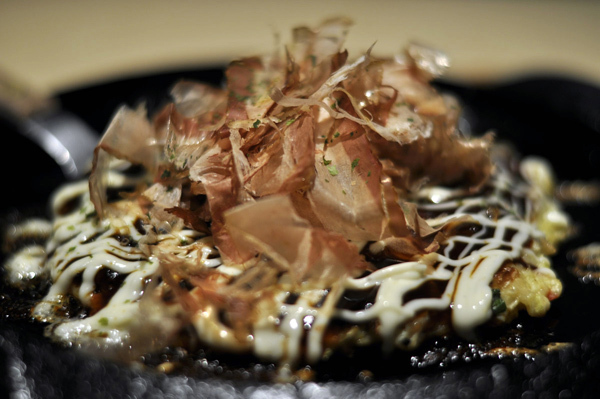 There are many kinds of types of Okonomiyaki, which have pork, seafood,rice cake, and cheese. 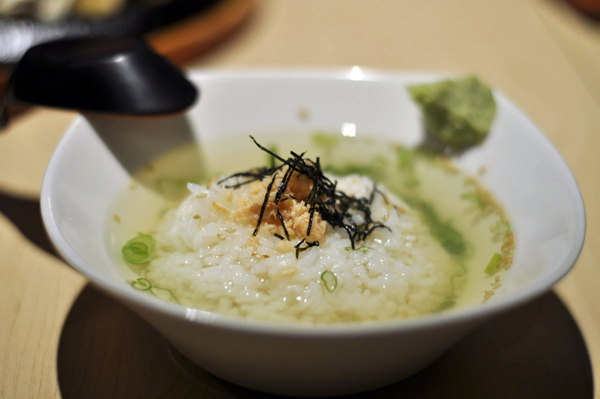 Rice in Dashi soup, $3.99: This meal is called Ochazuke in Japan, which is usually eaten at lunch or before dinner. 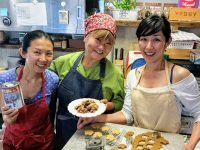 You can taste the dashi in Koyoi’s soup. 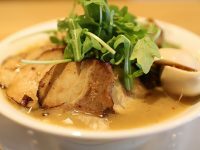 It has good umami, which is a kind of home cooked and familiar taste for Japanese people. You can also add wasabi into the soup. It can make for powerful accent; however, be careful because it can overpower the other tastes. Seaweed makes the soup salty, and, actually, Japanese people usually put in green tea instead dashi soup. Ochazuke is also very popular food in Japan, can be easy to finish eating. As well, it has a great taste. I can say that this is the Japanese taste. 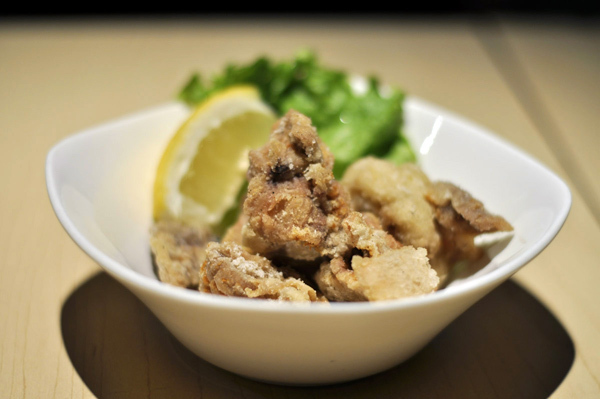 Deep-fried chicken, Karaage, $5.50: The karaage has a salty taste, so you should add lemon. The chicken is sweet and juicy, and tastes great with lemon, which makes you want to eat more. Though it is deeper fried than Gushi, so less juicy and oily, it tastes healthier and that’s a good thing. Karaage is fried chicken and is another very popular food in Japan. There are some street shop in Japan and Toronto that sell it. The chicken is juicy and sweet. Lemon is a great combination with it. 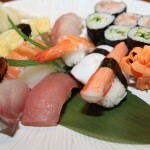 Dinner for two is usually around $30, but as the restaurant has smaller portions you might need to spend a little more. Koyoi’s interior helps us relax with its white walls and clean environment. On the inside, it looks like a four-star restaurant with bottles of Sake on the shelves and advertisements all in Japanese, which gives it a more casual look. 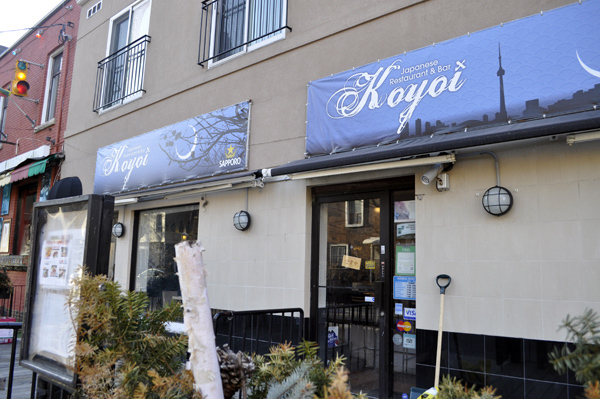 Koyoi also has a patio that opens in May, and that must be good for anyone looking to drink a beer on a hot day. The servers inside are Japanese, but they are able to serve in English as well. Someone from Montreal or Quebec who can only speak French might have trouble communicating, but the servers are nice and courteous. I reckon that they should create a French menu sometime soon. Japan has many kinds of restaurants that focus on one kind of Japanese food like Okonmiyaki, Nabe (hot pot), or Teppanyaki. I wish we had more restaurants like Koyoi that offered many kinds of Japanese food in one sitting. I never eat expensive Japanese food daily like at a Kaiseki Ryori where there are multiple rounds of vegetable-based dishes, or at a Sousaku Ryori that has exotic and artistically designed foods. 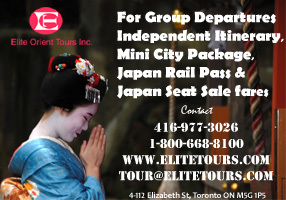 These are usually reserved for weddings or parties, and are usually quite expensive. Koyoi offers great tastes in a high-class environment not unlike a casual Kaiseki or Sousaku Ryori. I would definitely recommend Koyoi to anyone looking to get a taste of all corners of Japan without actually having to go there.